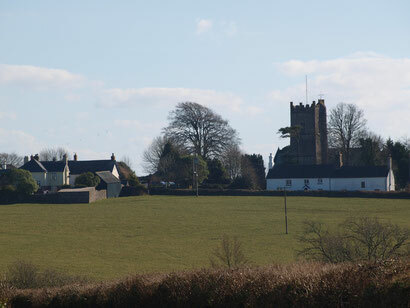 Burrington, like most parishes has little, if any recorded history before the Doomsday Survey of 1085/6 and nor for many years after – unless there are documents awaiting discovery in deed boxes or a vault somewhere. Probably the oldest building in the Parish is Holy Trinity Church. The stone structure standing today was rebuilt in the 15th century when the south aisle was added. The earlier church built approximately 300 years before must have been smaller with just the nave and chancel. The list of incumbents is from 1277. There is a Norman font and a granite arcade between the nave and the south aisle. The solid granite pillars forming the arcade were transported from a quarry on Dartmoor, many miles away. The wagon roof of the nave has numerous Tudor bosses, and that of the south aisle has 38 carved angels where the beams rest on the walls. Carvings of the Green Man can also be found. The Tudor screen is a fine example of 15th century Devon craftsmen’s carving. Painted red, blue and gold of special interest are the carved pomegranates, a tribute to Catherine of Aragon when she married Henry VIII – they are the badge of the Kings of Grenada. The stone porch was added in the 16th century, shielding the original door from the weather and preserving the shot holes that are believed to be from Cromwellian muskets! The church was restored in the 19th century when the gallery at the west end was removed. The fine Jacobean altar rails were restored in 1930 and the altar inside the rails was brought from the Mission Church at South Molton Road (by Riverside garage) in 1972. The Mission Church ran for about 100 years and had been built for the convenience of people living along the Taw valley. The brass plaque war memorials on the north wall of the church record the names of 13 men who died in World War I and 2 who died in World War II. Of note outside the church are the bosses on the windows west of the porch, of ladies wearing head dress of the time of Henry VI. Continue on the path around to the back of the church, walking towards the tower to find the listed headstone to the grave of the Woolway family recording the deaths of five children from diphtheria in 6 days. There are a great number of documents held at North Devon record office for a more detailed study of the church. The church is supported by Burrington Church Building Trust and Friends of Holy Trinity. The Methodist Church was converted from 2 cottages in 1829 by a local non conformist congregation, known as Bible Christians, who until this date had met in the houses of its members. These houses were licensed as Preaching Houses to give them some protection by the law for it was not unknown for meetings to be broken up by rowdy mobs. Amalgamating with other non conformist churches in 1907 and 1933 it was until recently part of the Rings Ash Methodist circuit. It is now joined to the South Molton circuit since Rings Ash became too small to be viable. The Gospel Hall was built in 1846 at the end of Leachland farm lane, as a place of Christian worship but was also a “Dame” school for several years until the later part of the 19th century. A small, square building with adjoining graveyard, it closed in 1993 and is now converted to a private dwelling. The school was built in 1856 on a plot of land on “The Green” given by the Earl of Portsmouth (who owned virtually all the village) to the Minister and Church Wardens of the Parish of Burrington. The Green, formerly the bowling green, still exists as a public open space with play equipment and seating adjoining the parish hall. Built as an all age school for 130, it became an Infants and Juniors school only when the seniors were transferred to the new senior school at Chulmleigh in 1937. Over 150 years later Burrington school continues as a lively, modern place of education now part of the Chulmleigh Academy Trust group of schools which has helped to secure the future of the school in the village. Across the road from the school is the ancient part of the thatched Barnstaple Inn. Burrington, being on the old stage coach route from London to Barnstaple, had this inn on the left hand side when travelling to Barnstaple, with the London Inn on the left when journeying to London – and all place in between. The London Inn has been a village shop – not a pub – for possibly nearly 100 years. The completion of the road – now the A377 – through the Taw valley by the Barnstaple Turnpike Trust in 1830 and the opening of the Exeter to Barnstaple railway alongside it in 1854 must have had a serious effect on the trade and viability of businesses along the stage coach route through villages on the ridge road. The Barnstaple Turnpike Trust was wound up in 1879 after being in existence for 117 years. Their final act was to replace the mile posts with 105 granite stones on roads maintained by the Trust and a red granite stone in the wall of the Barnstaple Guildhall marking the centre. Burrington still has a complete set of mile stones. After the 10 miles to Barum stone near the entrance to Libbaton golf course, the next by Dole Park Lane in the parish is 11 miles, above and opposite Bryhers Cottage is 12 miles, the shop in the village 13 miles and the top of Bircham Hill by a gatepost is 14, whilst Colleton Bridge in the parish of Ashreigney is 15 miles to Barum. Most of those along the A377 have been lost or are no longer visible. The ancient oak tree in the square was old and hollow over 100 years ago, when children were then able to climb up inside the trunk to stand out on the spreading branches. This was before the highways authority filled the base with waste tarmac! Reputed to be several hundred years old a severe pruning in the early 2000’s reinvigorated this hardy tree. In the past this tree was used as a parish notice board and as shade or shelter for those attending Trinity Monday cattle fair held in the square and road. Hopefully the tress is now fit for another 100 years. Sadly Burrington Fair ceased in 1993 joining a long list of villages who used to have cattle and sheep fairs. A Victorian post box is still in use in the roadside wall of a cottage at Northparks on the road to Chulmleigh, the site of the former blacksmiths – one of at least three in the parish at one time. A photo of this smithy is one of many old photographs of people and places in the parish copied by the late James Ravilious as part of the Beaford Archives. Before the first hall was opened in December 1930, apart from the church, the school was the largest building available for public and social occasions, but obviously not without a great deal of effort to create an open space in a room full of school desks. The Comrades Club, an ex-army hut erected and opened in 1922 for ex-service men and parishioners to play skittles, darts, billiards etc probably replaced the former Reading room. The Reading room was upstairs room at the back of the London Inn stores, now part of London Inn Cottage where skittles and other games had been played and a newspaper available for those who could read – hence the name “Reading Room”. In 1943 the hall that had been built in 1930 and the adjoining Comrades Club room was totally destroyed by fire. A second and temporary corrugated asbestos hall was erected after the war and was replaced by the present hall in ……….. Over the years several extensions have virtually doubled the size of the hall. A recent update has given the Parish a hall suitable and available for any occasion with a main hall, adjoining committee room, billiard room, large carpeted club room, modern kitchen and bar and large car park.